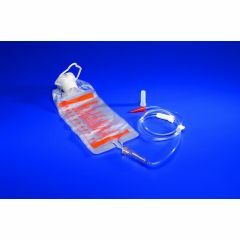 KANGAROO™ Enteral Feeding Gravity Sets are to be used in the absence of an enteral feeding pump. 1000ml capacity graduated bag with 7.5' tubing. Screw clamp feed rate control. Sold as Single (EA). Case lots of 30 also available. My husband has been using this product with his PEG tube for feeding since his surgery and treatments for Head & Neck Cancer. It works well, but can be a little messy ~ not the fault of the bag, but the person filling it. Average Health. Medical Professional. Athletic. Caregiver. Maybe I was just unlucky, but the first time I used it I dropped the bag as I was hanging it up and the side seam split open. It only had a little saline in it and only dropped 2-3 feet. Other bags have survived my clumsiness. Just wish it had been one of the old bags to break and not the brand new one!